Looking back I think Siri knew I was sister wife material. Driving along, not long after joining what David called ‘the iphone revolution’ I pushed the button and spoke into the headphones “Call my husband”. Siri said I don’t know who your husband is Amanda, so I told her and she responded with would you like me to remember that <insert friend’s husband’s name here> is your husband? No. No. No. No. No. Noooooooooo! I pulled the car over so quickly you’d have thought I was a member of the Holden Precision Driving Team. As I frantically mashed the keypad, I accidentally confirmed I was married to Susan’s husband. Then, I had to delete him from my phone entirely, for fear that Siri would one day dob me in for having designs on Susan’s man. Flash forward a few years and it’s occurred to me that Siri, that smartphone oracle, predicted the future. 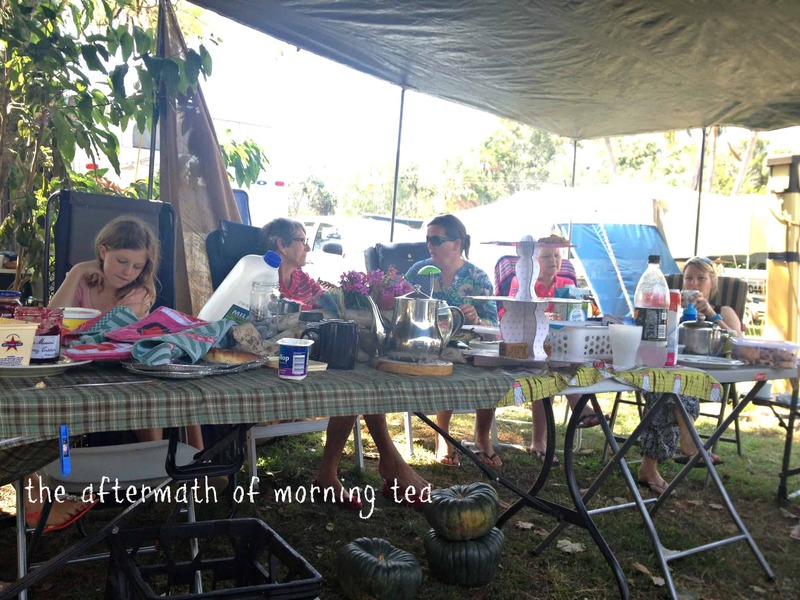 The girls and I recently enjoyed a week camping at Poona with Susan and her family. Bearhands had to work, so he came up for the weekend and then headed home. Leaving me and the kids to live commune-style with Susan’s family. Susan makes a pretty good sister wife. If I’d washed the clothes and hung them out, I’d discover that she’d taken them off the line and folded them. When my kids needed baths Susan’s kids (old enough to be super helpful) returned them to me clean and in their jammies. With all this help, we had time up our sleeves to get a bit creative for morning tea. When the planets finally aligned and I was able to share a photo of our crockpot brownies, the response was crazy – so I thought I’d share how we did it. brownie mix (packet mix is easy when you’re camping. If you’re an overachiever, or have more than one sister wife, you might like to try this recipe instead). Scrunch the foil into long lengths and curl them in the bottom of the crockpot to make a trivet. The foil will hold the cans off the base of the slow cooker – stopping them from burning on the base. Put the lid on the crockpot and set it to high. This will ‘preheat’ the slow cooker. Spray your prepared tins with cooking spray. We cut the tops off beer cans and used them. If you use food tins, you might even be able to remove the bottom from the tin to turn out your finished product. At the risk of simultaneously sounding like your Mother and Mr Maker – if you decide to go the beer can option, be careful. Scissors (and beer cans) are sharp! 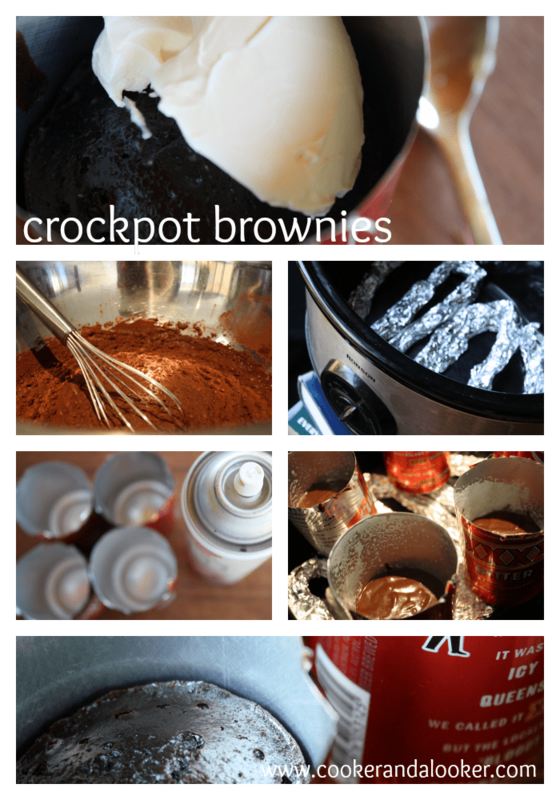 Fill the cans with a few spoonfuls of brownie mix and arrange them on the foil. Replace the lid and bake. You’ll know your brownies are ready when a knife inserted in the middle comes out with a few moist crumbs attached. Slow cooker models vary greatly, so it’s hard to specify a cooking time. Ours took about forty-five minutes. I expect baking them in food tins would take a little longer. Serve in the tin with dollop cream. When it came time to pack up camp, Susan and my adopted husband helped me pack up our trailer and sandwiched me all the way home; Susan pulling the tinnie at the front and my stand-in spouse following behind and making sure I managed to pull the trailer home safely home. Turns out, the key to packing up camp without an argument is to do it with someone else’s husband! has Siri said something odd to you? ever thought about taking a sister wife? *no Mum, your precious Granddaughter did not travel home in this unsafe manner. I totally made her wear her helmet. Thanks Lizzy – I think camping is so good for kids. It teaches flexibility and problem solving. I love camp oven cooking too. I doubt they would – DOCS if you’re reading I only put her up there for the photo. She was strapped into her car seat demanding biscuits the whole way home! Great idea! Also making camping easy by using a brownie mix is a great idea. Easy to pack and if you don’t use it, it wont matter. My 4 year old just saw your last picture and asked if she could ride like that too! I know – this is a game changer. Can’t wait to experiment with puddings and other good stuff! Thanks Shari, I’m pretty discerning when it comes to choosing life partners! What a hoot. I totally love going away with other mums as they just… get it… help… share the load… MUCH better than my own beloved. Siri is someone I am yet to befriend… think I’m scared of her. Oh my goodness I just laughed so hard I cried!! The brownies look and sound gorgeous! 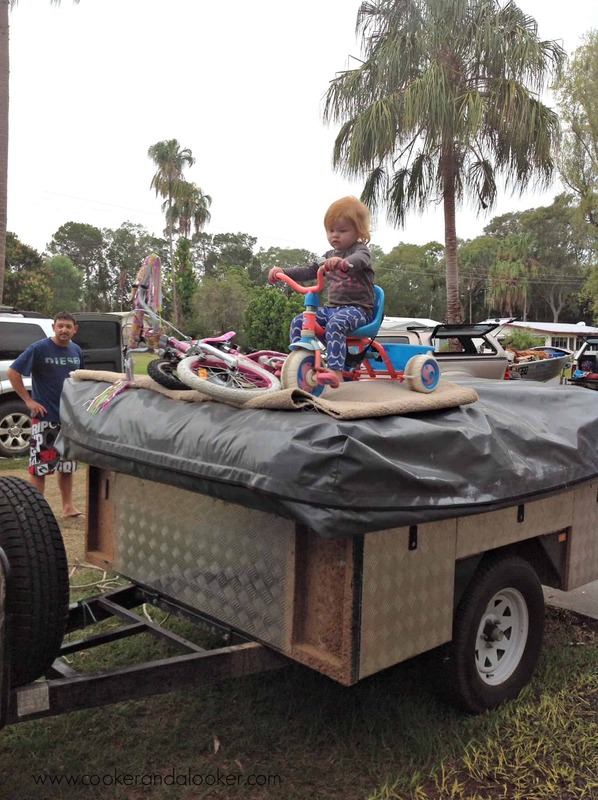 Packing up camp without an argument by using someone elses hubby…..I think you have found the secret! Now if you can tell me how to pack for camp, without arguments, that could transform my life! Loved this post Amanda! Made me laugh & enjoyed the ‘sister wife’ story! Totally going to try the beer can brownies – yum! I want a sister-wife!! Ha! Laughed so much with this post!